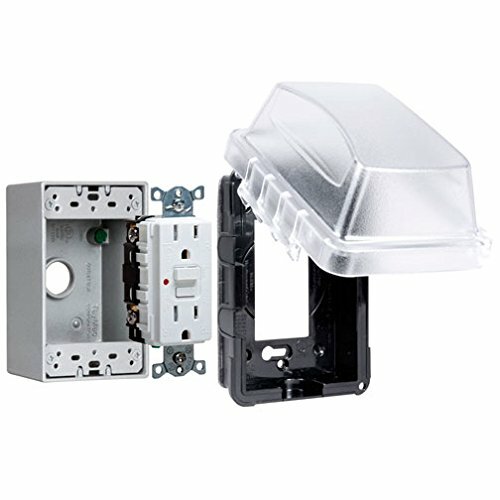 Taymac MKG410C Outdoor GFCI Outlet Kit with Box, Weatherproof Cover, and Protected Receptacle If you are installing an outlet in an outdoor area, this complete kit comes ready to wire. The Outlet Box is Constructed of Superior Commercial Quality Die Cast Metal. The cover is Constructed of Durable Impact Resistant Polycarbonate that Resists Breakage and Corrosion. It features a Quick-Fit Patented Key Hole Mount that Allows for Easy Installation. The unit Includes attached gasket and mounting hardware. Comes complete ready to wire. Importantly it is UL Listed and 2008 NEC Compliant. It comes ready for use in wet, damp, or dry location. If you have any questions about this product by Hubbell Bell, contact us by completing and submitting the form below. If you are looking for a specif part number, please include it with your message.